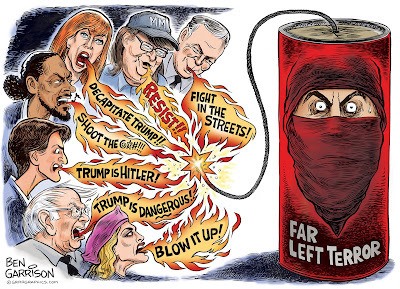 Rogue Cartoonist: "Lighting The Fuse"
Others such as Bernie Sanders, Hillary Clinton and Michael Moore are calling for some sort of ominous ‘resistance’ to Trump. Former Vice Presidential Candidate Tim Kaine (whose son is a member of the Antifa) actually called for "fighting in the streets." Loretta Lynch called for “blood in the streets.” The mainstream media was complicit in conveying anti-Trump violence all along. Remember when they suggested he may not make it to his own inauguration? Rachel Maddow compared Trump to Hitler. It’s OK to kill Hitler, right? Once you strip someone of their humanity by smearing them as ‘Hitler’ or a ‘racist,’ then it’s fine to commit acts of violence on them. That’s what they did during the Spanish Inquisition. They labeled people ‘heretics’ and then tortured them. It’s a method starting to be used by the Antifa today. Anyone with whom they disagree with is automatically labeled a ‘fascist,’ and it’s fine to use violence against fascists. Many in the mainstream media have made menacing comments about Trump. The Secret Service must have a hard time keeping up with it all. I had trouble keeping up with all of it in my cartoon. Additional: I worked on the cartoon very late last night and erroneously had Madonna saying "Burn it down" when she said "Blow it up!" She was referring to the White House. The cartoon has been updated. "Alex Jones Plays Megyn Like a Violin"
"My 20,000 Pt. Dow Life"
"A Change in The Weather"